Arrival Delhi Railway Station, Meet & Assist further drive to Haridwar. 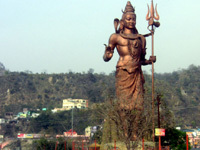 Later drive to Haridwar transfer to your Hotel. Visit Har-ki-Pauri for Ganga Aarti in evening. Back to your hotel, Night halt. Haridwar: Haridwar, lying at the feet of Shiva's hills, i.e., Shivaliks, in the Haridwar district of Uttaranchal Pradesh, is a doorway. Suryavanshi prince Bhagirath performed penance here to salvage the souls of his ancestors who had perished due to the curse of sage Kapila. The penance was answered and the river Ganga trickled forth forms Lord Shiva's locks and its bountiful water revived the sixty thousand sons of king Sagara. In the traditional of Bhagirath, devout Hindus stand in the sacred waters here, praying for salvation of their departed elder. 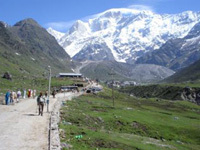 It is doorway to the sources of the Ganga and the Yamuna, 3000 to 4500 meters up into the snowy ranges of the central Himalayas. The 'Aarti' worship of the Ganga after sunset and the floating 'dia' (lamp) is a moving ritual. Morning visit Haridwar Local Sight Seeing, later drive to Uttarkashi. Check in Hotel, Later visit Vishwanath Temple. Night Halt. 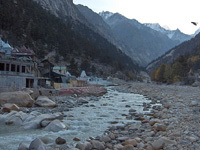 Uttarkashi: Situated at the bank of river Bhagirathi. The temple of Lord Vishwanath is located here where a massive iron trident is erected. The other important temples situated here are Ekadash Rudra, Bhairav, Gyaneshwar and Goddess Kuteti Devi. Drive to Badrinath via Joshimath. Check in Hotel. Later at evening visit Badrinath Temple for Aarti. Overnight stay. Badrinath one of the 'Four Dhams' is one of the most celebrated pilgrimage spots of the country and is situated at an elevation of 3,133 meters, guarded on either side by the two mountain ranges known as Nar & Narayan with the towering Neelkanth Peak providing a splendid backdrop. This revered spot was once carpeted with wild berries. Thus the place got the name "Badri van", meaning "forest of berries". Tapt Kund : Natural thermal springs on the bank of the river Alaknanda, where it is customary to bathe before entering the Badrinath temple. Narad Kund : A recess in the river, near Tapt Kund, forming a pool from where the Badrinath idol was recovered. Brahama Kapal : A flat platform on the bank of river Alaknanda. Hindus perform proppitiating rites for their deceased ancestors. Sheshnetra : 1.5kms. away is a boulder having an impression of the legendary serpent, better known as the Sheshnag's eye. Charanpaduka : 3kms. away is a beautiful meadow where the footprint of Lord Vishnu is seen on a boulder. Mata Murty Temple : Devoted to the mother of Sri Badrinathji. Other important temples include Sesh Netra Temple, Urvashi Temple and Charanpaduka. Mana Village : Inhabited by an Indo-Mongolian tribe, it is the last Indian village before Tibet. Vasundhara : As the name suggests, vasundhara is a magnificent water fall. This place is 5 kms. From Badrinath out of which 2 kms. Is motorable upto Mana. Bhim Pul : On the other side of Mana village, a massive rock forming a natural bridge, lies over the roaring Saraswati river. It presents a spectacular view of water thundering down through the narrow passage under the rock and is believe to have been placed there by Bhim, the second eldest among the five Pandava brothers. Vyas Gufa (cave) : Near Mana Village, this is a rock-cave where Ved Vyas is believed to have composed the Mahabharata and the pauranic commentaries. Early morning, pilgrims after having a bath in the Taptkund have the Darshan of Badrivishal. Brahamakapal is significant for Pinddan Shraddh of ancestors (Pitrus). There are other interesting sight seeing spot like Mana, Vyas Gufa, Maatamoorti, Charanpaduka, Bhimkund and the "Mukh" of the Saraswati River. Just within the three kms of Badrinathjee. Later drive back to Joshimath/Kirtinagar. Check in Hotel. Overnight stay at Joshimath/Kirtinagar. Morning, visit Rishikesh Local Sight seeing & Temples. Later drive back to Delhi. On Arr. Delhi, transfer to Railway Station / Airport. Tour Terminate.